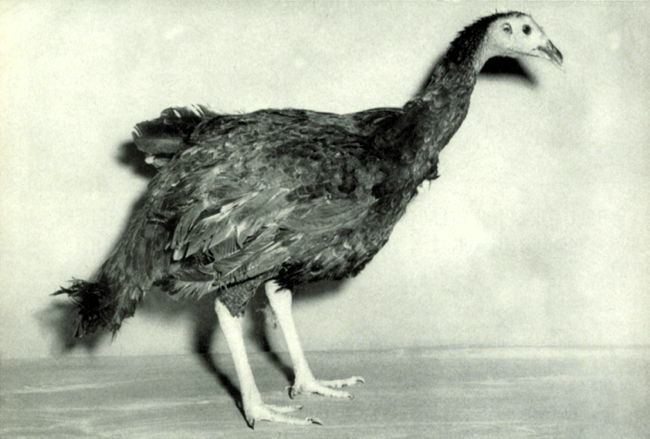 In 1960, scientists with the poultry research branch of the U.S. Department of Agriculture announced that they had successfully created a chicken-turkey hybrid. They called the new bird a "churk." 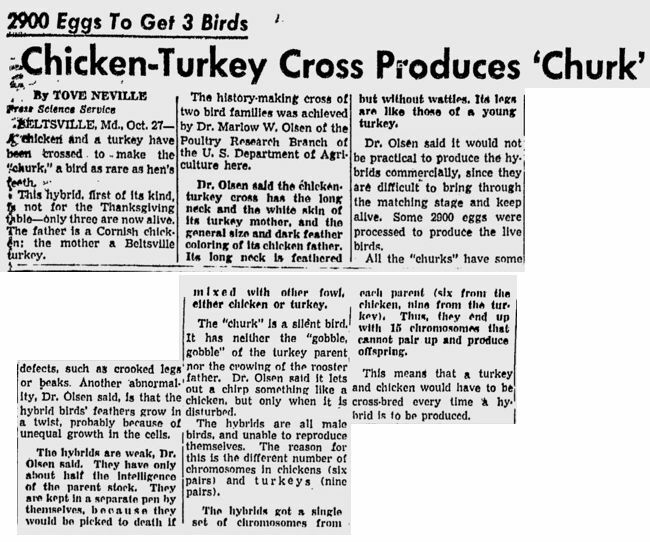 It was the first time such a cross had ever successfully been achieved — one of the obstacles being that chickens have six pairs of chromosomes, and turkeys have nine pairs. Churks ended up having 15 chromosomes. The scientists created three male churks. These three were not only the first, but also apparently the last of their kind. They suffered from mental retardation, having only half the intelligence of either chickens or turkeys. They were mostly silent, only letting out a feeble chirp if disturbed. 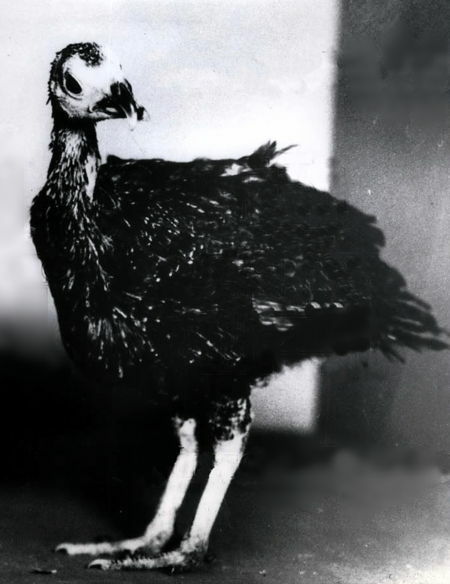 They had the long neck, legs, and white skin of a turkey, but the general size and coloring of a chicken. All three churks had some defects, such as crooked legs or beaks. They had to be kept in a separate pen from the chickens and turkeys, to prevent them from being pecked to death. Half the intelligence of a turkey? Does this mean we now know the Donald Trump origin story? Many, many years ago, there was a man on Johnny Carson's show who'd bred chickens to be as large as turkeys. They had one come on stage -- clearly a chicken, but huge! I kept my eyes open, but that's the one and only time I ever saw anything about it. It's impossible (at least for me) to Google because turkeys and chickens are mentioned together on so many websites. I always wondered if they didn't breed true or if the turkey industry bought the secret and buried it to protect their interests. Phideaux -- I think you may be referring to Grant Sullens, the young man who created Weirdo, the cat-killing superchicken. I'm pretty sure he was on Johnny Carson at one point. The Jersey Giant male chicken weighs 12LB which is the size of a small turkey. @Alex -- That's very likely what I saw. I don't remember a mention that it was mean, but he might not have mentioned it on air. I'm still waiting on the breakthrough geneticists promised us in the 1960s -- a 4-legged chicken so everyone could have a drumstick. Sure thing, tadchem. Unfortunately this character, and many of its contemporaries like Deputy Dawg, Tennessee Tuxedo, Rocky & Bullwinkle, will never be seen again. Although their spirit does live on in some modern animation, such as "Family Guy." 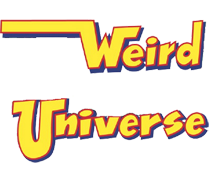 I'm still laughing over that one, tadchem, as I do watching the adventures of any of the heroes from that program, like George of the Jungle, Dudley Do-right and Nell, and Sherman and Mr. Peabody in the Wayback Machine. I expect they tasted fowl  and to: "Phideaux in his own little world"........A four legged chicken? How do you catch the blighter? @Dave P -- With 4 legs instead of 2, you're twice as likely to catch them in a snare. This is pretty normal for birds. Birds, for reasons that aren't yet clear, can outcross with species far more distant than with other groups like mammals. Most of the time different species even in the same genus can't interbreed but birds can frequently interbreed with species in *different* genera as long as they're in the same family (as is the case here). Distant crosses have only male survivors (Haldane's law) and are generally really messed up. These crosses don't happen in the wild because birds are pretty picky about mates.